This tree grows to 60 feet tall with a diameter of 3 feet. 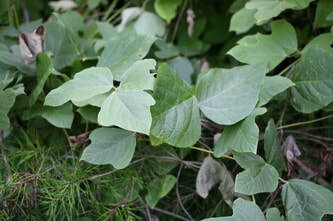 The leaves are composed of 7 to 11, smooth edged, sometimes silky leaflets that are 2 to 4 inches long. The leaves are pinnately compound and alternate. The buds are hairy, and there are often several (one above the other) that are hidden beneath the hollow leafstalk bases. In winter, they are surrounded by u-shaped leaf scars. There are grape-like clusters of white blooms. The twigs are stout, the end buds are false, and there are 5 bundle scars. 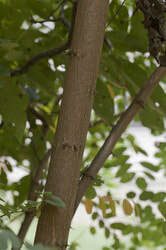 The bark is smooth gray, and the wood is yellow. Cladastris lutea flowers from May to June. The fruits look like pea pods and occur between September and October. This flower grows up to 18 inches tall. Rose-pink flowers are borne in compact clusters or heads that are 1 inch across. The stems are hairy and hollow. 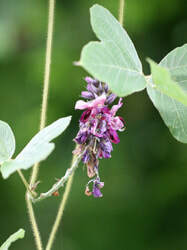 The leaves are alternate with 3 lanceolate to elliptical leaflets (1 inch long) each with a pale green "V."
The Red Clover is not native to North America; it has been introduced from Europe. It was used initially on farmlands for hay, pasture, silage, and soil improvement. This plant flowers from May to August. It is found in pastures and waste places, and along roadsides. This flower grows from 4 to 16 inches tall. It has white or pale pink flowers that are condensed in a compact round head from 3/4 to 1 inch across. The leaves are alternate with 3 obovate leaflets, each with a pale green half-moon. Trifolium repens was introduced from Europe and Asia. Some states may classify it as weedy, noxious, or invasive, but it is considered to be forage for deer, elk, sheep, and cattle. This plant flowers from April to September. It is found in fields, roadsides, lawns, and waste places. Kudzu is a semi-woody vine that grows to 100 feet long. The leaves are compound, usually with 3 leaflets, and hairy beneath. The leaves are often lobed. The flowers are reddish-purple, 1 inch wide, and 4 to 8 inches long. Kudzu was introduced from Japan by the Department of Agriculture in the southeastern United States in 1876 to control erosion. It is an extremely invasive species. 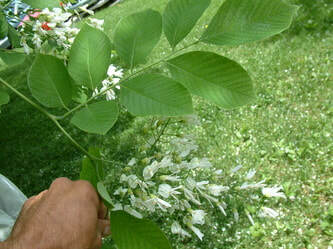 The stems can be used for making baskets and wreaths. Kudzu has been used to treat alcoholism, hangover, high blood pressure, chest pain, sinus infections, cold, swine flu, psoriasis, skin rash, menopause symptoms, diabetes, migraine, and other diseases. For other medicinal uses, click here. This plant flowers from July to October. It covers trees along roadsides, in woods, and grows along the ground in fields. This plant has trailing or climbing stems that are up to 3 feet long. The stems are smooth or appressed-hairy. 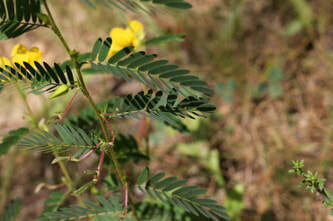 The leaves are alternate, pinnate, and have 5 to 10 pairs of leaflets that are .5 to 1 inch long. 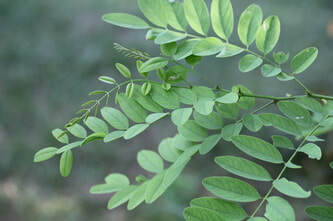 The leaves are narrowly oblong or lanceolate linear. The flowers are blue=purple and are up to .8" long. There are typically 5 to 15 flowers in one-sided racemes. This flower was introduced from Europe and has escaped to roadsides, fields, and waste places throughout most of the United States. 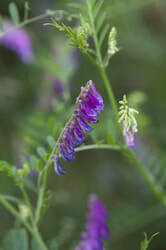 Smooth vetch is considered frequent and flowers from May to August. This flower grows up to 3 feet tall. 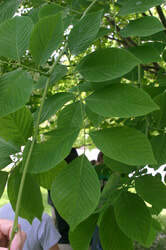 It's leaves are pinnately compound with 5 to 18 leaflet pairs. 1 to 6 flowers arise from the upper leaf axils. The flowers have 10 stamens, 5 petals (to .8" long). 4 of the petals have red markings at the base. 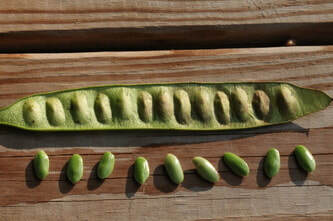 The fruit is a straight, narrow pod 1.5 to 2.5 inches which splits as it dries. The pod sides spiral to expel seeds some distance form the parent plant. The Cherokee Indians made a root medicine to keep ball players from tiring and gave a compound infusion for fainting spells. The Seminole Indians used a cold decoction from boiling plant material for nausea and used the plants as a bed for ripening persimmons. The seed is a major food item for some birds and mammals. It is a honey plant. Nectar is produced by small orange glands at the base of the leaf; ants seek the nectar. The Common Sulfur butterfly lays its eggs on the leaves and the larvae use the leaves as a food source. 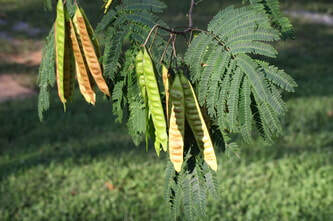 The leaves are light-sensitive and fold at night. This plant flowers and fruits from July to September. It grows on bluffs, riverbanks, and river bottoms, and is most common on sandy soils. This tree grows from 70 to 80 feet tall, with a diameter of 2 to 3 feet. The bark is deeply furrowed, dark, and crosshatched on old trees. 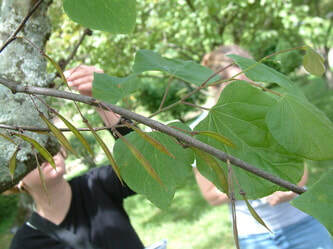 The leaves are alternate, pinnately once-compound, and 6 to 12 inches in length. 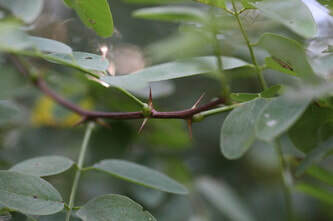 Strong, paired thorns, 1/2 to 1 inch long, flank nearly circular leaf scars. 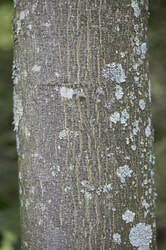 The twigs are moderately stout and hairless with 3 bundle scars. The end buds are false. 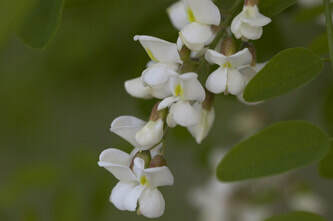 Flowers are medium sized, white clusters that are very fragrant. The fruits are long, flat pods. 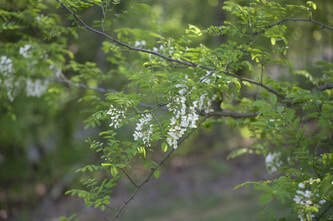 The Black Locust is often planted for fence posts. Young shoots are sometimes poisonous to livestock, but the seeds are eaten by Northern Bobwhite, Ring-necked Pheasant, Mourning Dove, Eastern Cottontail, and White-tailed Deer. 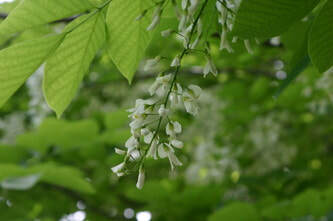 The flowers occur from May to June. Fruits are present from September to April. This tree grows from 20 to 40 feet tall. 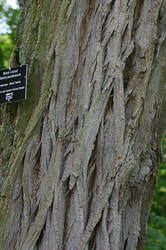 The bark is light brown and smooth. 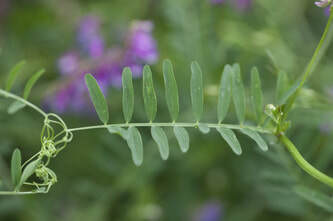 The leaves are alternately arranged, bipinnately compound, and 6 to 20 inches long. The leaf arrangement gives a feathery shaped appearance. The flowers are pink pom-poms. 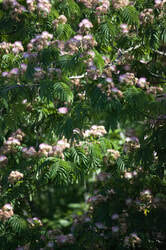 The Mimosa was introduced from tropical Asia and Africa. It is an invasive species. The leaflets fold up at night. This tree flowers throughout the summer. The fruits mature in the summer. 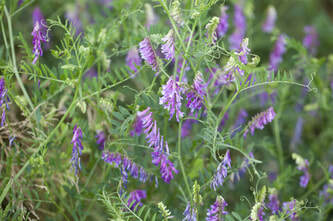 It is found in open areas including wasteland and dry, gravelly soils. This tree grows up to 40 feet tall and 8 inches in diameter. 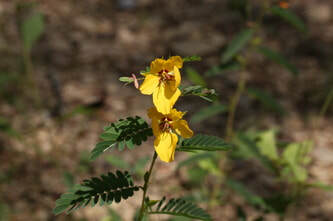 The leaves are long-stalked, cordate, and alternately arranged with smooth edges. There are 5 to 9 main veins. Red-purple flowers that are 1/2 inch long and pea-shaped appear in the spring. There are 4-8 flowers in a cluster on slender stalks. The fruit is bean-like. This tree is often planted as an ornamental. The flowers can be eaten as a salad or fried. According to myth, Judas Iscariot hung himself on the related Judas-tree of western Asia and southern Europe, after which the white flowers turned red with shame or blood. 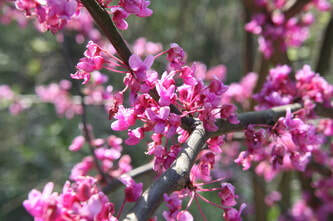 The flowers appear in the early spring before the leaves appear. The fruit fall in late autumn or winter.